King David Swords for sale are 47 inches in all and include a free display plaque. 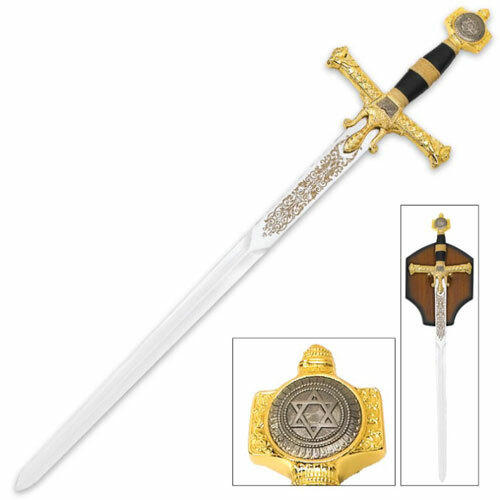 These King David Swords feature a mirror polished blade and shiny gold colored metal accents. The 36 inch blade is crafted of 440-stainless steel with a display ready, factory edge and ornate gold-colored medieval etchings. The guard features molded two-toned cast metal. A silver colored Star of David is engraved into the large gold colored metal pommel. These massive swords include a free large wooden display plaque. Buy the popular King David Swords for $149.99.